Description: Steam distilled from the flowering tops of the Ocimum Basilicum, this oil is almost colorless to a pale yellow with a sweet spicy, slightly green, fresh, with a faint balsamic woody back note and a lasting sweetness. Aromatic Scent: Basil Oil has a sweet-spicy, fresh aroma with a faint balsamic woody undertone. .Common Uses: Basil Oil is praised in Ayurvedic medicine for its ability to strengthen compassion, faith and bring clarity. Traditionally, it has also been used to relieve muscular aches and pains, colds and flu, hay fever, asthma, bronchitis, mental fatigue, anxiety, and depression. In aromatherapy Basil is used to soothe and uplift. It is popular with massage therapists for alleviating tension and stress in their patients. It also helps to clear the sinuses, so it is a favored ingredient by naturopaths when treating many respiratory ailments. When applied in dilution, Basil is reputed to be a good insect repellent, while the linalool's mild analgesic properties are known to help to relieve insect bites and stings. Historical: In Greek its name means 'royal remedy' or 'king'. In the 16th century, powdered basil was used to treat migraines and chest infections. 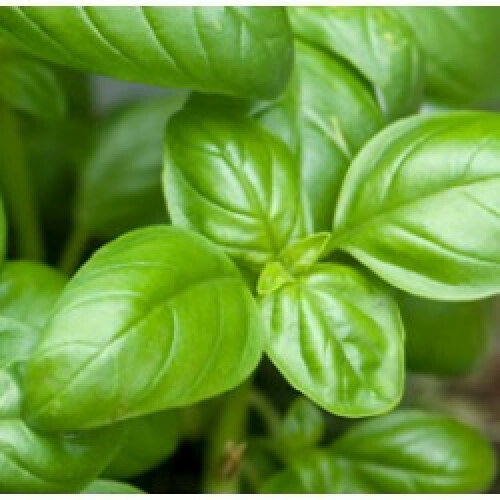 There are many rituals and beliefs associated with basil, which is native to Africa and Asia. The ancient Egyptians believed that it would open the gates of heaven to a dying person, and the Hindus use Basil sprigs to protect the dead from evil while in transition between lives. Western European lore sometimes claimed that it was a symbol of evil, while the Eastern Orthodox Church used it in the making of holy water.